Kim Scodro combines her appreciation for the classics with modern sensibilities in one of the country's most prestigious showhouses, and shares with us how to create the master suite of our dreams. 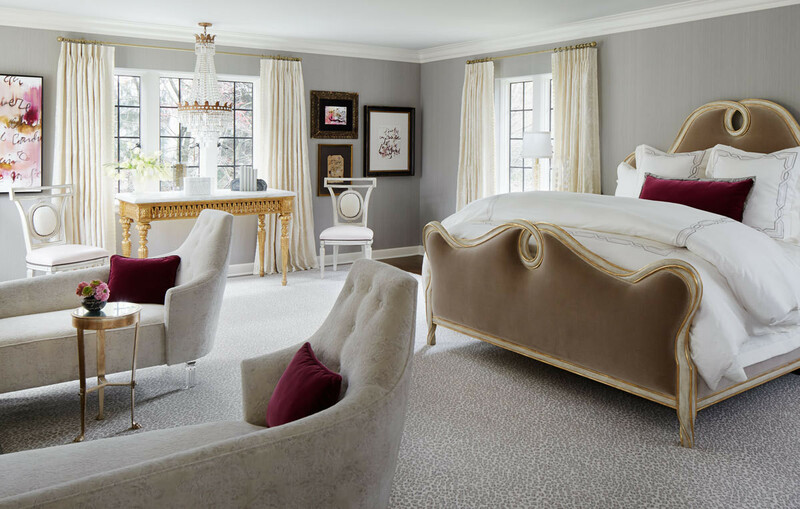 Complete with its own crystal chandelier and custom chaise lounge chairs, designer Kim Scodro created a romantic master bedroom for the Lake Forest Showhouse. Photography by Werner Straube. In the design world, it’s no small accomplishment to be selected to participate in a showhouse. The Lake Forest Showhouse, which began in 1985 and is held biannually throughout the affluent Chicago suburb, highlights some of the country’s best designers while supporting the Infant Welfare Society of Chicago. "I had the best experience," recalls interior designer Kim Scodro, whose participation in this past year’s showhouse was her first ever. The site of the spectacle took place in a sprawling 11,000 square-foot Tudor mansion just a stone’s throw from Lake Michigan that was once owned by famed filmmaker John Hughes. From the Garden Room to the Lady's Retreat, nearly thirty designers were assigned specific rooms to work their decorating magic. As luck would have it, Scodro, a Chicago and Phoenix-based designer, was given the master bedroom. "It's liberating and frightful at the same time," explains the designer of the unique circumstances of a designing for a showhouse. "When you don’t have a client to direct you, you create a narrative," says Scodro. She imagined designing for a well-traveled couple enjoying their empty nest, who share a passion for art and adventure; their glamorous bedroom a respite in between their far-flung jaunts. Jetsetting bon vivant or not, a blissful bedroom is an obtainable luxury for all of us, and it all boils down to strategy. 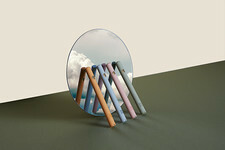 With Scodro as our guiding force, the designer shows us just how we can attain the aesthetic ourselves starting with—what else?—color. 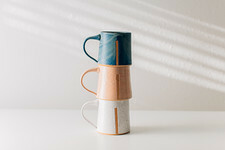 A glass-fronted cabinet holds various pieces of pottery made by Francine Turk, who’s also responsible for creating the artwork hanging on the walls. 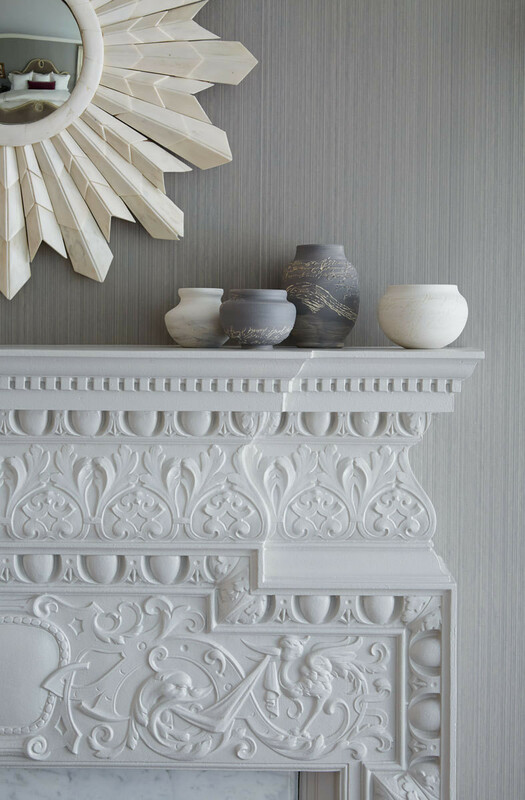 “It’s always worth trying to preserve things,” says Scodro, who transformed the room’s old European fireplace from a dark bronze to a creamy white by painting the detailed façade. 1. Stick to a Subtle Hues. "Calming palettes create peace and tranquility upon entering the room," says Scodro, who settled on a mix of cool grays and feminine pinks to create a lux retreat. It all started when the designer fell in love with a ballet pink leather that was quickly assigned to cover a pair of accent chairs. 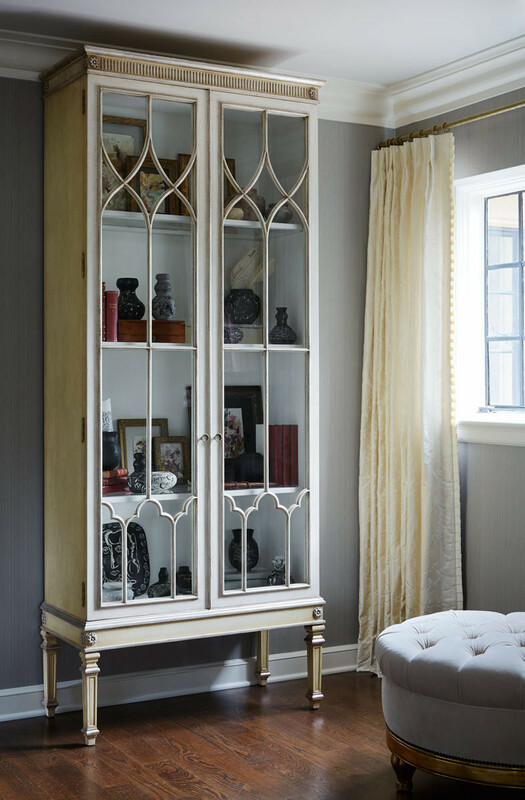 Neutrals and creams came into play on the room's leopard-patterned rug and the damask drapes. "Soft[ness] is always a winner in a bedroom." 2. Make it a No-Work Zone. Scodro adheres to one strict rule when designing a bedroom—no workstations or exercise equipment allowed. "Who wants to go to bed looking at work that is piling up on your desk?" asks Scodro. And don't call that gilded table near the window a desk. "That's a library table," explains the designer. "It's not even the right height of a real desk. It's meant to hold your art books. A statement-making chandelier from Ebanista hovers above a gilded library table overlooking the home’s lush two-acre property. 3. Get the Light Right. Like with any room in the house, lighting is crucial. It's important to remember that not all light sources are created equal. Mounted sconces offer a warm source of ambient lighting, while bedside table lamps make reading in bed possible. With the remarkable pieces of art in the room, directional can lights highlight the pieces in a gallery-like manner. And don't forget the power of dimmers. "They're a game-changer," says Scodro, "everyone needs a dimmer." 4. Experiment with Styles. "This project confirmed classic and current design could live beautifully together," reveals Scodro. How? Start small. Take the lounge chairs surrounding the fireplaces: Svelte acrylic legs support their midcentury lines, leaving the boudoir-esque chaises feeling rather contemporary. 5. Invest in Artwork. It's easy to justify a pricey art splurge when you tell yourself it'll hang in a public space for everyone to enjoy. But nothing says luxury quite like a little collection all to yourself. 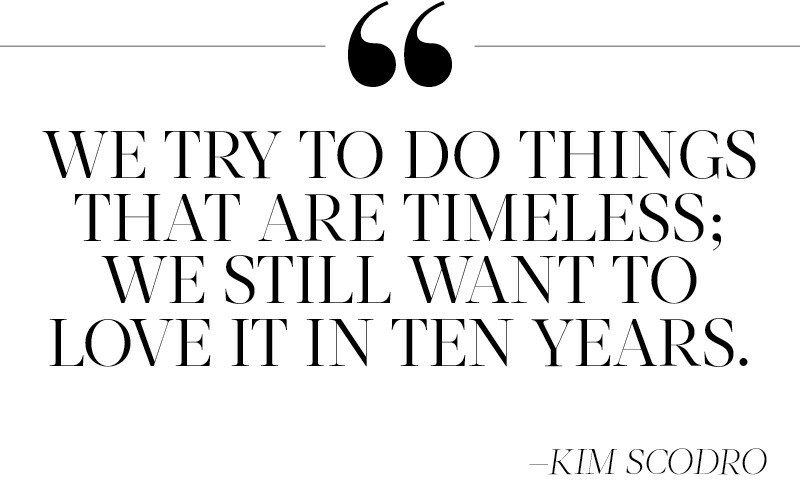 "People just don't think about how much time we spend in our bedrooms," says Scodro. "This is where we spend our quiet time, our alone time—what a treat to enjoy your art just before you fall asleep and as soon as you wake up." From sheepskin and pink leather to Lucite and crystal, the master bedroom is a study in fine finishes. 6. Up the Ante. The bedroom is the perfect place to get a little fancy with textiles—think silks, velvets, and cashmeres. "It's not too often you bring red wine or greasy snacks to your bedroom, so why not splurge on luxurious fabrics?" defends Scodro. "I'm not saying to make it untouchable, but just don't be afraid." 7. Mix Your Metals. Have no fear—mixing golds and silvers is no longer a design faux pas. "I'm a firm believer that if you love something, it will work," says Scodro, "mixing metals is proof of that." And don't forget the finishings. Shiny, hammered hardware can have a far different effect than matte. 8. Focus on the Bed. "First and foremost, all bedrooms need an inviting bed," says Scodro. While not exactly a groundbreaking thought, it's an important one nonetheless. Creating a plush bed is easier than you think, and it all comes down to layers. "I'm not drawn to flat beds," admits Scodro. Think Euro shams, a folded quilt, and pretty throw pillows. As for linens, leave the patterned sheets for the kids and stick with all white. The curvacious velvet-upholstered bed from Ebanista and the oversized figure painting are just two of the glamorous focal points found in the room. 9. Embrace Architectural Quirks. The master bedroom didn't come with the tall ceilings Scodro had hoped for. "Typically we treat the ceiling as the fifth wall, and traditionally we would highlight it," says Scodro. But instead her focus was to distract the eye from the noticing the lack of height. How'd she do it? She veered from using patterned drapes that would normally call attention to the height of the room. As for the walls, vertically lined wallpaper "subconsciously draws the eye up." Scodro wasn't going to let the room's low ceilings stop the designer from hanging a show-stopping chandelier. "We tried it every which way," recalls the designer, but ended up hanging it above the library table where nobody would walk under it. 10. Offer Additional Seating. "You have to have to have seating in the bedroom," directs Scodro, whose beautiful master boasts seating beyond a plush bed. Whether it be a tufted ottoman to sit on while putting on your shoes or a chaise lounge chair perfect for curling up with a book, the more options, the better.